The sights both inside and out are unbelievable here. Take in the waters of Long Bay Beach from anywhere in the villa, or hop the set of stairs to the side of the deck and jump in. There’s a bedroom for kids, and four bedrooms for you and your friends. What’s not to love? Spectacular views of Long Bay Beach! 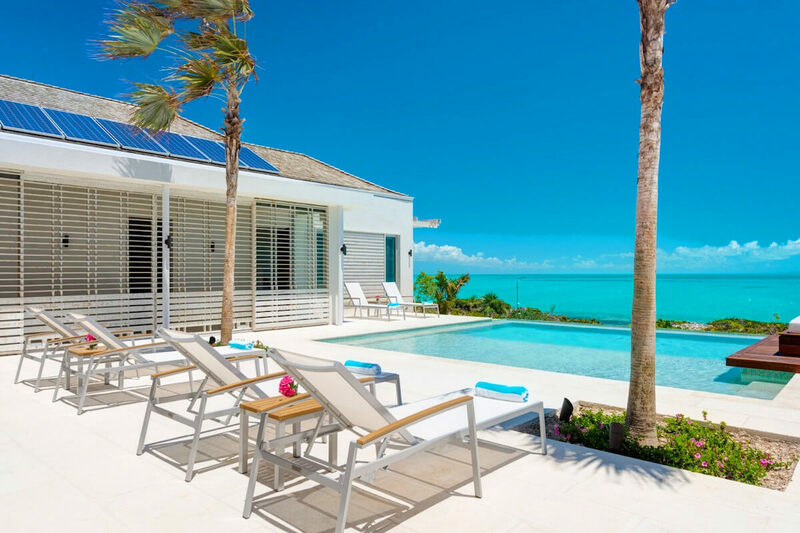 Aguaribay is located on Long Bay Beach among some of the finest homes in Providenciales. This fully air-conditioned villa sits atop a dune with scenic ocean views. Follow the staircase down to the beach to lounge on the white sand, ride kayaks atop the turquoise sea, or kiteboard through the waves. There’s a shower halfway down the stairs, so guests can rinse off salt and sand before coming back to the villa. Aguaribay has a private infinity pool surrounded by a glass barrier and lounge chairs for the best views. Guests can take it easy on the sun bed while listening to the gentle sounds of the sea or dine al fresco with a stunning view. Inside, vaulted ceilings and whitewashed interiors decorate the Great Room. Watch TV on the flatscreen in the living room, feast around the dining table, or cook a gourmet meal in the fully equipped kitchen. A sound system and WiFi run throughout, and there’s a half bath and laundry room off the main area. Four of the villa’s five bedrooms are master suites with king beds, TVs, ocean views, and ensuite bathrooms. Downstairs, there’s a children’s room and a media room with a flatscreen TV. The children’s room has two queen/twin bunks, a garden view, and an ensuite bathroom. The lower level opens to the garden gazebo. Aguaribay is only 10 minutes from the nearest restaurant and a minute from the beach. Long Bay is known for great waves and a largely undeveloped shoreline thats perfect for tranquil, tropical getaways. Our family of eight just had one of the best vacations staying at Aguaribay on Long Bay Beach! As soon as you open the front door, the view of the blue skies, turquoise ocean, and infinity swimming pool will take your breath away. This villa has everything you would need to make your stay here as comfortable as possible, but the best is Demas! His daily visit was welcomed and appreciated, as he provided services that allowed us to enjoy our vacation and not worry about housekeeping chores. He also kept the villa in pristine condition! We enjoyed cooking in the large kitchen, grilling outside, laying poolside, kayaking, taking outdoor showers, and swimming in Long Bay. This was our first visit to Turks and Caicos and Aguaribay. Andrew from WhereToStay and Demas helped make it a vacation we will never forget! 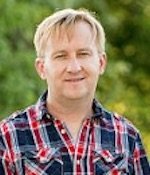 We loved working with Andrew and the staff of WhereToStay. Andrew and his family frequently vacations in T&C, so his knowledge of the island is firsthand, extremely helpful, and spot on! He is extremely responsive, organized, and does not miss a detail to ensure that your family has one of the best vacations ever! We had a group of 7 on our family trip and had an unbelievable time. Everything was first class as soon as we got picked up from the airport. The villa was spacious and extremely clean, even better than the pictures and description. We grilled or cooked almost every day, and the kitchen had everything we needed. The pool is very family-friendly and the beach is amazing. There’s lots to do there, we walked and went snorkeling on our own around Long Bay. We felt very safe and comfortable. Everything on the island is a short drive away. The best villa and island I have ever been too. We can’t wait to go back. I would definitely stay at Aguaribay again, whether with family or a group of friends. This villa can accommodate all. Andrew was very helpful throughout the whole process. He was very quick to respond to any email or phone call. He had a lot of knowledge of the villa and the area. We had an amazing experience. I highly recommend Aguaribay villa for families and or couples. It has an amazing private location while only being minutes away from the rest of Turks. The villa staff were amazing, as was our experience with WhereToStay. We had a great experience working with Sharon. We will use WhereToStay again for future vacations. There were 12 family members that vacationed at the Aguaribay Villa from 7/15 - 7/22. Age ranges went from 11 months to 67 years old. Everyone had a wonderful time, and we couldn’t have asked for more. The villa is as beautiful as the pictures. If we wanted to just stay at the villa there was plenty to do. A beautiful pool and serene beach… what more could you ask for? We used the outdoor kitchen everyday. Getting to Grace Bay was very easy from Long Bay. Maybe a 10 minute drive. I would highly recommend this Villa and hope someday to return. Andrew was great. If I had any questions all I had to do was send and email and he quickly replied. I will not hesitate to reach out to him for our next trip. My family of 4 children, all girls, had the time of their lives at this house. The location and beaches are incredible, and the hospitality was second to none. We’re a family that likes to do breakfast and lunch at the house and then explore at night for a great dinner spot. This location was perfect for that, as it had everything you need to relax all day long, whether it be at the pool or on the bay. Site offered kayaks, which my wife and daughter loved, especially when the water only gets about 6’ deep. Can’t thank Andrew enough for steering us in the right direction. We will be back!!! !